This article is about the Lower Rio Grande Valley. For the New Mexico wine region along the Middle Rio Grande Valley, see Middle Rio Grande Valley AVA. For the city, see Rio Grande City, Texas. The Rio Grande Valley is an area located in the southernmost tip of South Texas. It lies along the northern bank of the Rio Grande, which separates Mexico from the United States. The four-county region consists of Hidalgo, Cameron, Willacy, and Starr counties. It is one of the fastest growing regions in the United States, with its population having jumped from about 325,000 people in 1969 to more than 1,300,000 people by 2014. Some of the biggest cities in the region are: Brownsville, Harlingen, Weslaco, Pharr, McAllen, Edinburg, Mission, San Juan, and Rio Grande City. The Rio Grande Valley is not a true valley, but a floodplain, containing many oxbow lakes or resacas formed from pinched-off meanders in earlier courses of the Rio Grande. Early 20th-century land developers, attempting to capitalize on unclaimed land, utilized the name "Magic Valley" to attract settlers and appeal to investors. The Rio Grande Valley is also called El Valle, the Spanish translation of "the valley", by those who live there. The residents of the Rio Grande Valley no longer refer to the area as "El Mágico Valle del Río Grande" ("The Magical Valley of the Rio Grande"), but as "The Valley”. The main region is within four Texan counties: Starr County, Hidalgo County, Willacy County, and Cameron County. As of January 1, 2012, the U.S. Census Bureau estimated the population of the Rio Grande Valley at 1,305,782. According to the U.S. Census Bureau in 2008, 86 percent of Cameron County, 90 percent of Hidalgo County, 97 percent of Starr County, and 86 percent of Willacy County are Hispanic. The largest city is Brownsville (Cameron County), followed by McAllen (Hidalgo County). Other major cities include Harlingen, Edinburg, Mission, Rio Grande City, Raymondville, Weslaco, Hidalgo and Pharr. The Rio Grande Valley experiences a warm and fair climate that brings visitors from many surrounding areas. The east side of the region experiences a humid subtropical climate, and becomes more arid as one heads west. The Valley is one of the southernmost areas of the continental United States, with only a small stretch of southern Florida laying at a lower latitude than the city of Brownsville. Also the region shares a similar climate to that of peninsular Florida. Due to its southerly location, the lower Rio Grande Valley tends to be very warm in comparison to northern areas. While having average temperatures that land the region a semi-tropical climate, the lower Valley only misses tropical climate status by a few degrees. Furthermore, the area lays in a transitional climate zone; therefore, cities like Brownsville and South Padre Island land in a tropical savanna climate classification during years when winter months are slightly warmer than average. Due to this, the lower part of the region has been known to sustain tropical plants such as flame trees, Cuban Royal palms, and coconut palms. Temperature extremes range from triple digits during the summer months to freezing during the winter. Taking into consideration the region’s warm weather, periods of triple-digit weather occur much more often than those with freezing temperatures. While the Valley has seen severe cold events before, such as the 2004 Christmas snow storm, the region only occasionally experiences temperatures at or below freezing. These happen less often near the coast, where in some cases, never see temperatures below 35-40 degrees. Arctic cold fronts bring colder weather to the region but tend to dissipate quickly with daytime heating. The Rio Grande Valley’s proximity to the Gulf of Mexico makes it a target for hurricanes. Though not impacted as frequently as other areas of the Gulf Coast of the United States, the Valley has experienced major hurricanes in the past. Hurricanes that have made landfall in or near the area include: Hurricane Beulah (1967), Hurricane Allen (1980), Hurricane Gilbert, Hurricane Bret, Hurricane Dolly (2008), and Hurricane Alex (2010). Having an especially flat terrain, the Valley usually experiences the catastrophic effects of tropical cyclones in the form of flooding. Due to threats of storm surge, the impending impact of tropical cyclones usually results in the closing of the Queen Isabella Causeway and voluntary -or sometimes mandatory- evacuations of the city of South Padre Island and coastal Cameron and Willacy counties. Severe weather in the Rio Grande Valley typically occurs during the spring months. While the area doesn’t see intense severe thunderstorm and tornado events like in the northern part of the state of Texas, the South Texas region is not immune to hail and supercell events that result in brief tornado touchdowns. 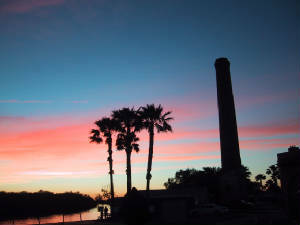 The Lower Rio Grande Valley encompasses landmarks that attract tourists, and popular destinations include: Laguna Atascosa National Wildlife Refuge, Santa Ana National Wildlife Refuge, and Bentsen-Rio Grande Valley State Park; and on the coast: South Padre Island, Brazos Island, and the Port Isabel Lighthouse. The Valley is a popular waypoint for tourists visiting northeast Mexico. Popular destinations across the border and Rio Grande include: Matamoros, Nuevo Progreso, Río Bravo, and Reynosa, all located in the Mexican state of Tamaulipas. The Valley also attracts tourists from the Mexican states of Tamaulipas, Nuevo León, Coahuila, and Mexico, D.F. (México City). The Valley is historically reliant on agribusiness and tourism. Cotton, grapefruit, sorghum, maize, and sugarcane are its leading crops, and the region is the center of citrus production and the most important area of vegetable production in the State of Texas. Over the last several decades, the emergence of maquiladoras (factories or fabrication plants) has caused a surge of industrial development along the border, while international bridges have allowed Mexican nationals to shop, sell, and do business in the border cities along the Rio Grande. The geographic inclusion of South Padre Island also drives tourism, particularly during the Spring Break season, as its subtropical climate keeps temperatures warm year-round. During the winter months, many retirees (commonly referred to as "Winter Texans") arrive to enjoy the warm weather, access to pharmaceuticals and health care in Mexican border crossings such as Nuevo Progreso. There is a substantial health-care industry with major hospitals and many clinics and private practices in Brownsville, Harlingen, and McAllen. Texas is the third largest producer of citrus fruit in United States, the majority of which is grown in the Rio Grande Valley. Grapefruit make up over 70% of the Valley citrus crop, which also includes orange, tangerine, tangelo and Meyer lemon production each Winter. There are two minor professional sports teams that play in the Rio Grande Valley: The Rio Grande Valley Vipers (basketball), and Rio Grande Valley FC Toros (soccer). Defunct teams that previously played in the region include: the Edinburg Roadrunners (baseball), La Fiera FC (indoor soccer), Rio Grande Valley Ocelots FC,(soccer), Rio Grande Valley WhiteWings (baseball), Rio Grande Valley Killer Bees (ice hockey), and the Rio Grande Valley Sol (indoor football). One of the Valley's major tourist attractions is the semi-tropical wildlife. Birds and butterflies attract a large number of visitors every year all throughout the entire valley. Ecotourism is a major economic force in the Rio Grande Valley. As of 2016, officeholders tend to be Democrat, this is in part because of its large Hispanic population. It is common for voters to be influenced by members of their own extended families and by prominent families in their towns, so politicians often try to make friends with family groups to increase their chances of getting elected. As of 2006, about 20,000 to 30,000 people in Cameron County habitually vote in primary elections, and Presidential elections have higher turnouts. Politiqueras, women hired to help elderly people vote, are crucial in South Texas elections. Cecilia Ballí of Texas Monthly wrote that voters expect to get favors from politicians they vote for, and if they do not get these favors they become resentful of politicians as a whole. University of Texas Rio Grande Valley — Entered into full operation in 2015 with the merger of the University of Texas at Brownsville and the University of Texas–Pan American. UTRGV will include a new medical school. ^ Ballí, Cecilia. "The Bad Guy With the Badge" (Archive). Texas Monthly. August 2006. Retrieved on May 25, 2016. Wikivoyage has a travel guide for Rio Grande Valley. This page was last edited on 31 March 2019, at 17:20 (UTC).